The essential components of Bluegrass music are acoustic instruments and vocal harmonies. In spite an apparent, superficial simplicity, Bluegrass is a sophisticated, organised musical form played by virtuoso musicians who play because they love to play. There are no tricks, no gimmicks, no electronic aids - it is all hand made and beautifully crafted. When the official concert is over, the musicians will look for the nearest jam session so they can go on playing just for fun. We love our festival in part because there is no star system and our headline acts can be seen all around town and the festival site, having fun picking with complete strangers. It is how the music is transferred from generation to generation, from country to country and person to person. It is all about playing. It is all about sharing. It is all about the music. 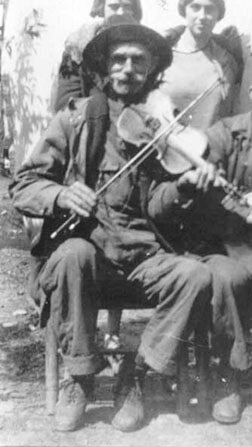 Bluegrass music was "invented" by Bill Monroe in the 1940s. He grew up in Kentucky listening to traditional mountain music, brought over from his ancestors' Scottish home, and to blues played by the local black population. 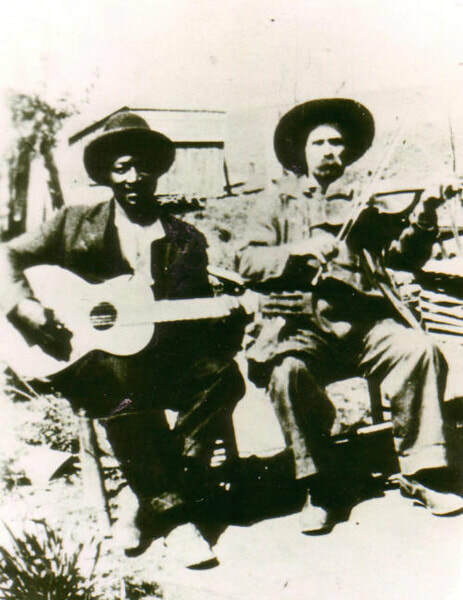 Two of his biggest influences were his Uncle Pendleton Vandiver, right, for whom he wrote the classic song, Uncle Pen, and black bluesman Arnold Schultz (left). Throughout his early musical years he searched for the sound that encapsulated both of these influences that he wanted to hear in his music, first with his borther Charlie, and then with his own band The Blue Grass Boys (named after the state of Kentucky). His band went through several mutations before exploding onto the stage of the Grand Ole Opry in Nashville in 1946 with guitarist-singer Lester Flatt and a young banjo player named Earl Scruggs, who brought a new 3-finger playing style to the banjo, played against Bill Monroe's syncopated mandolin with the chop on the off beat, that would lay down the benchmark and become the definitive "sound" of Bluegrass music. Listening to the drive and the beat on this early music in the late 40s, you can clearly pick up early signs of rock'n'roll and, indeed, Elvis Presley listened to Bill Monroe as a teenager and recorded his song "Blue Moon of Kentucky" on the B-side of his first record. 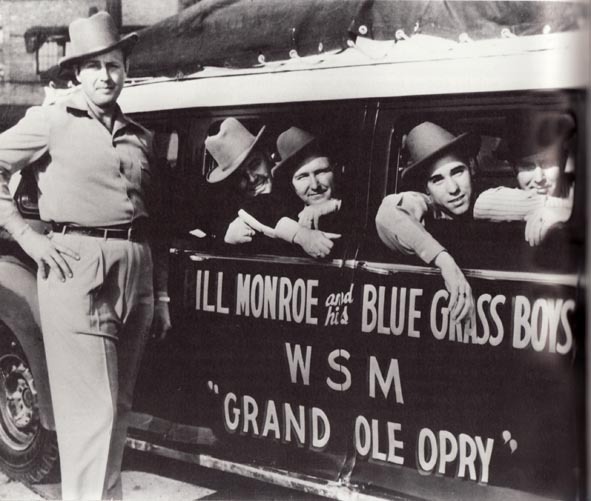 Bill Monroe's music was very popular across the south and as demand for it grew new bands imitated the sound and radios played this "music of the blue grass boys". Thus the name stuck and Bluegrass Music became a new genre of American made music. In the 1950s Bluegrass lost much of its momentum with the explosion of rock'n'roll but it gained new audiences again with the folk revival of the early 1960s, on the college campuses and through the Newport Folk Festival. Bands like the Country Gentlemen took the music to the sophisticated city venues and young artists like Jerry Garcia (Grateful Dead) and Peter Rowan gave the music a San Francisco twist. 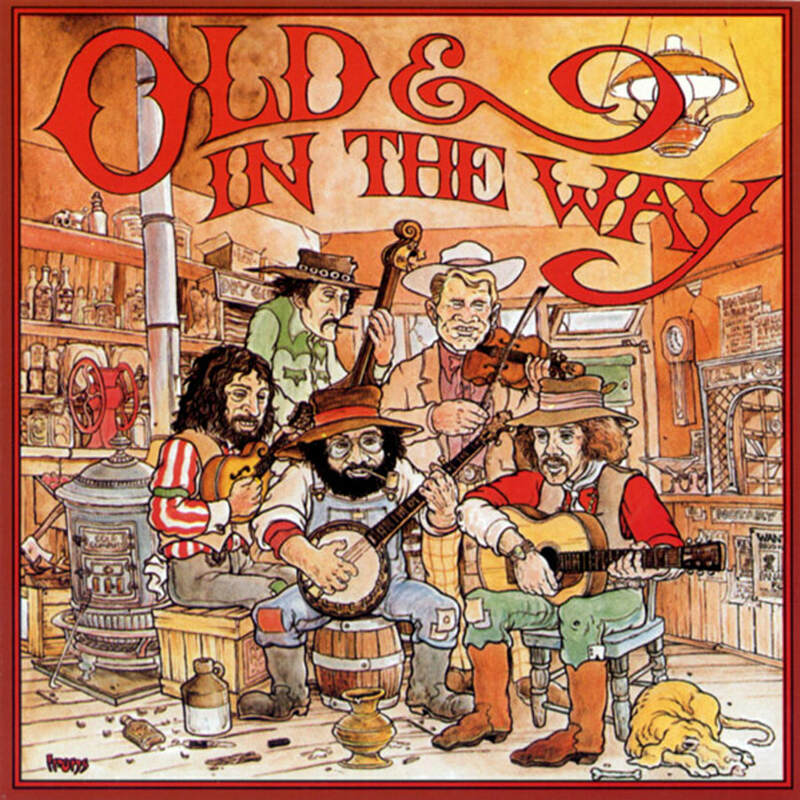 Album cover of the iconic Old & in the Way vinyl (1972) with John Kahn, Vassar Clements, David Grisman, Jerry Garcia, Peter Rowan. The new generation of acoustic music lovers grew up listening to the Beatles, the Rolling Stones and the Doors. Some went to Woodstock. They wanted to play their acoustic music and to express their influences. Bands started to play rock and pop songs in the Bluegrass style and to write new songs in their own modern Bluegrass style. In California, we saw the Weset Coast style of Old and in the Way (Jerry Garcia, Peter Rowan, David Grisman, Vassar Clements), whose inconic album drew many people towards Bluegrass (including the founder and president of La Roche Bluegrass Festival). In Washingon, the Seldom Scene perfected the Bluegrass-pop crossover style in the footsteps of the Country Gentlemen, playing modern and traditional songs in perfect Bluegrass style with impeccable playing and exquisite harmonies. Meanwhile, in Tennessee, a new band started playing what could be described as "rock music in a bluegrass style". The band, led by Sam Bush, gave itself a name to suit their music: New Grass Revival, a name that captures both the modern and traditional aspects of their music. While these bands, and many others, played their bluegrass with a contemporary attitude, they still continued to play the old songs of The Carter Family and Bill Monroe. Although these musicians were breathing new life into traditional acoustic music and capturing a whole new audience, Bill Monroe did not like the long hair and where they were taking the music in the beginning, famously saying "That ain't no part of nothing!" Sam Bush, Peter Rowan and David Grisman actually went on to become respected elder statesmen of Bluegrass, appreciated by Bill Monroe. Bela Flek became the most famous banjo player in the world, experimenting with any form of world music that came his way. John Cowan joined rock legends the Doobie Brothers as their bass player. They all still play and promote Bluegrass music because while you can check in to Bluegrass music any time you like, you can never leave! 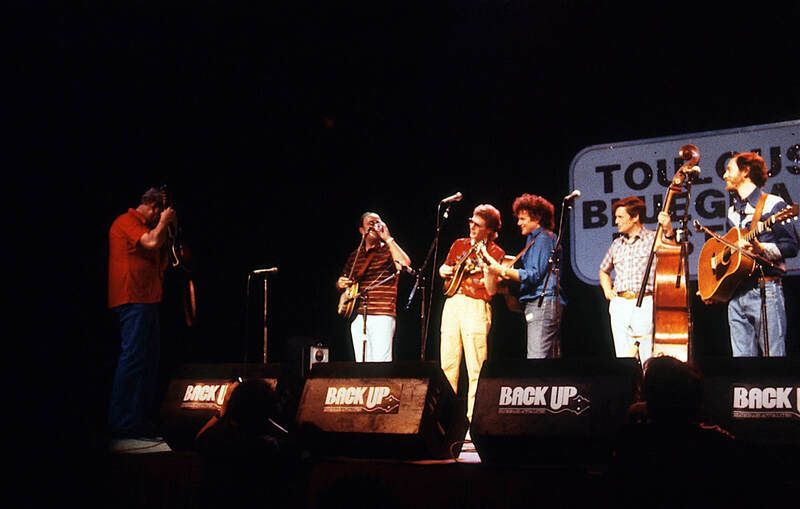 In the 1970s the first Bluegrass festivals started to appear. Today there are hundreds of them all over America, Europe, Japan and Australia. Each festival is an event, where people of all ages, with family and/or friends congregate to camp, play music, swop new songs and hear the top acts of the day. Bluegrass music has become an accepted genre in its own right, with its own category at the Grammy Awards. Top Bluegrass acts play at Carnegie Hall and in the prestigious concert halls of Washington DC and Los Angeles. 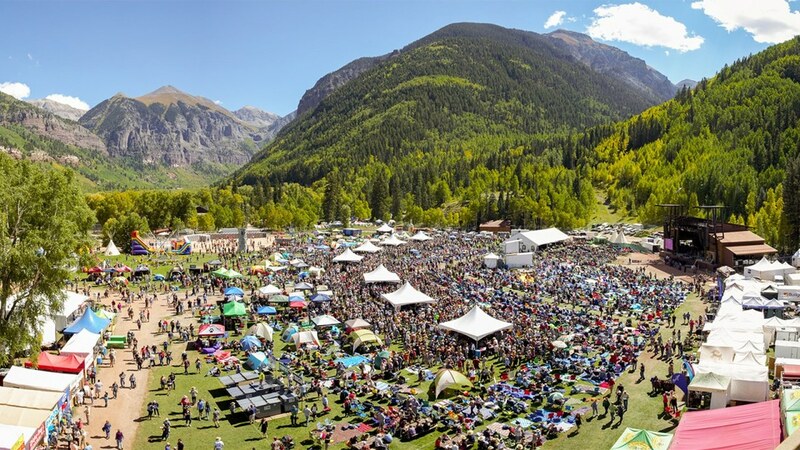 The development of the festival circuit was good news for professional Bluegrass musicians, giving them a chance to promote their albums, meet their fans and play for large audiences. It was also good news for Bill Monroe himself who became the recognised "Father of Bluegrass" and was much loved and respected, passing away in 1996 4 days before his 85th birthday. His "Father of Bluegrass" crown has not been officially passed on, but it is fair to say that Sam Bush, Peter Rowan and Del McCoury (the latter two Bluegrass Boys alumni) carry the torch between them with grace and honour, each in their own way. In 1985 the International Bluegrass Music Association was formed as a trade assocation to promote Bluegrass music and advocate on behalf of its members, mostly Bluegrass musicians but also anyone involved in the music, from luthiers, to managers, to event organisers and even fans. It holds its annual World of Bluegrass conference, trade show and festival at the end of September in Raleigh, North Carolina (previously in Nashville, Tennessee and before that in Louisville and Owensboro, Kentucky). The IBMA plays a difficult balancing act of keeping the traditional fans, raised on Bill Monroe and other first generation musicians, involved and interested, while embracing the modern acoustic music fans, raised on a broad range of musical styles and thirsty to integrate new sounds into their traditional playing. Bluegrass has been likened to a tree, with its roots planted firmly in the ground of its heritage (even the most far out, modern player will still enjoy jamming to a Bill Monroe classic), and with branches growing upwards and outwards, exploring new ideas. The two parts are inextricably held together by the trunk. It is an exciting time for Bluegrass music. There are some great bands and we are lucky to have seen some of them at La Roche Bluegrass Festival, playing traditional and modern Bluegrass. 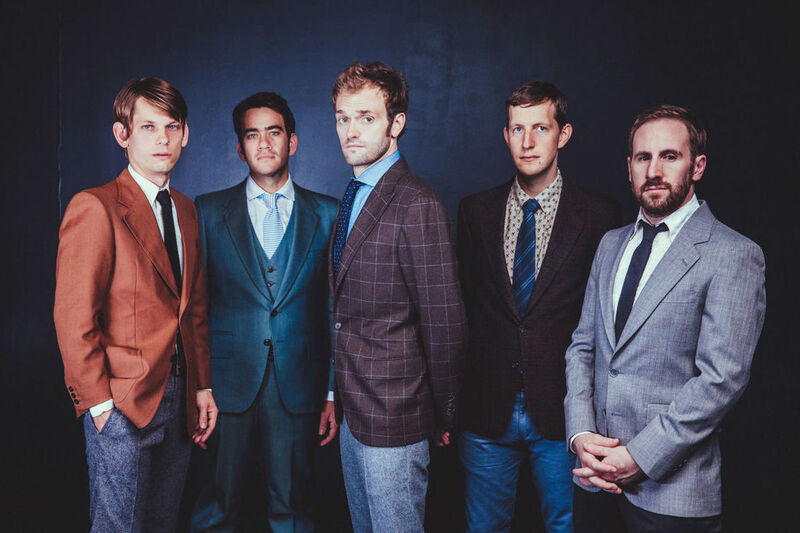 ​Musicians like Chris Thile, Sierra Hull, Noam Pikelny, Sarah Jarosz are receiving worldwide recognition as they take the music to new places and to new audiences. 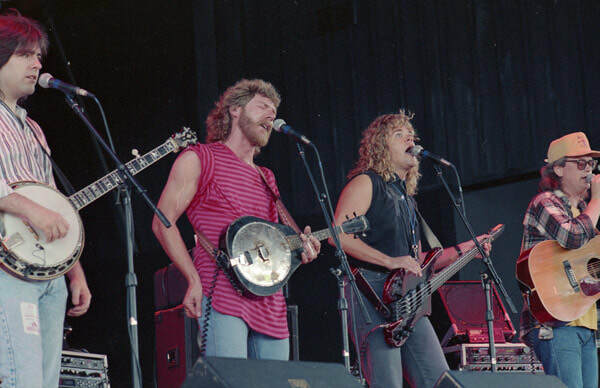 Famous musicians from the world of rock and pop are embracing Bluegrass, like Mumford & Sons and Led Zeppelin's Robert Plant, whose collaboration with Alison Krauss won a Grammy award in 2009.